Speaking of campfires, it’s almost as fun to build one as it is to smell one (see last week’s post). Even though most of my fires fail to fully ignite, I still love the challenge of engineering the perfect combination of kindling and logs that will take off burning when I light that match! We’ve had fun over the past few summers teaching our older two daughters the ins and outs of campfire creation. 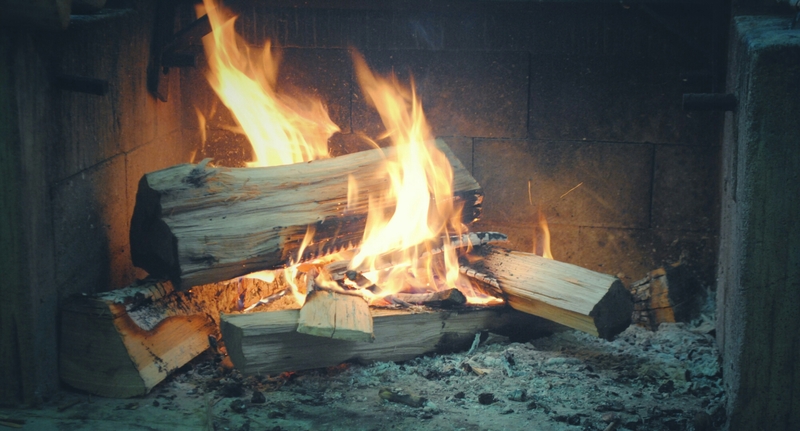 The most important step, of course, is collecting the firewood – every good fire needs a pile of sticks of varying widths. So, off you go into the woods to collect some branches – but not just any branch will do! In order to be good burning material, the sticks for your fire need to be dead, preferably for a long period of time. A branch taken directly off of a tree will not only potentially harm the tree, but it will not burn! But how do you know if a branch is “dead enough” to be good fire material? It’s simple – you just bend it. If it easily snaps in two, you’re good. If it’s flexible and doesn’t break, that means it’s not going to burn, but it may make a perfect marshmallow stick! When I received Christ into my life at age 16, I understood that I was beginning a relationship with Him. Up to that point, my understanding of God had been defined by church attendance, Bible stories, and my attempts to be a good person. This ‘religion’ stuff seemed easy enough to me – you do good things and you’ll have a good life. But when I got attached to the vine and began this ‘relationship’, I had no idea what I was in for! As much as I’ve loved having the security of His love and the power of His Spirit in my life, Jesus frustrates me sometimes. This is mostly because I’m a rule-loving, black-and-white-thinking, list-checking kind of girl – and He’s not that kind of God. I’ve often thought about how much easier it would be if He just worked in everyone’s life in the same way! Or even if He just worked in my own life in the same way all the time. Many of us have a tendency to, like the religious leaders of Jesus’ day, find something that works and then rigidly assume that it will always produce the same results for us – and everyone else as well. The Pharisees had thousands of rules that they tried to hold God’s people accountable to, and Jesus spent many of His words challenging their dead way of thinking. It’s not that their ways were bad in and of themselves, it’s just that they had completely disconnected from real human life and the flow of a relationship with a living God. I also have a hard time letting go when those ‘working’ things don’t seem to be going as (I) planned (oh that snooze button!) or when what I’m doing doesn’t seem to be helping me grow as much as it used to. Or if I feel God leading me to change things up a little during my morning routine and try something new (yikes!). Being rigid, setting ‘rules’, and doing what I know has ‘always worked’ somehow feels safer than following Him into the unknown. “Jesus Christ is the same yesterday and today and forever” (Hebrews 13:8), but He’s also alive yesterday, today, and forever! Even though His nature is absolutely unchanging, He is doing His living work in the midst of constant change in our world, our circumstances, and our hearts. And since His life is flowing through the vine and into us as branches, that means that staying connected to Him means staying flexible. There are things we don’t bend on – it will always be necessary to spend regular time connecting with and learning about God through His Word. But when we disconnect from the fact that life happens and that our God is a living God, we tend to get rigid and soon after, broken or burnt out. Religion is a cut and dry ‘you do this and that will happen’. Relationships are fluid, unpredictable, and ever-changing – and a relationship with Jesus isn’t any different! Having His life flowing into you means fruit-bearing is in your future. How, when, and what kind of fruit that is, though, is up to Him. And that means we need to stay in tune with the Holy Spirit and be willing to follow Him wherever and however He leads. Speaking of being flexible, tomorrow is the last day of school for my girls – summer is officially here! And for the Desilets, summer means two things: family time and SERVE (two weeks of service, adventure, and spiritual growth with our middle and high schoolers in Vermont). We’ve got a whole ton of work to do before July 16th and summer bucket lists to be accomplishing in the midst of it. My “insufficient space” warning messages are popping up all over the place, so something’s gotta go – and this is the only option. I’ll be taking the summer off from writing, but I’ll be back in September and I’m sure I’ll have plenty of words to share with you all! So whatever your summer looks like, stay connected to the Vine – and be flexible! Maybe you have extra time because your schedule slows down. Take advantage of that and dig deep into God’s Word. Or maybe, like me, your kids are home and that means you have significantly less time. Take this chance to change things up and get more focused in the little time you do have. Jesus is alive and He’s constantly working to flow His life into us. Life is growth and growth is change – so be flexible and let His life keep you truly alive! I love this time of year! Not because of the rise in temperature (finally!) or the anticipation of the school year ending – but because of the smells. I love that you can be driving around the neighborhood, take a whiff, and be transported immediately into summer by the smell of a backyard grill. The first application of sunscreen for elementary school “Fun Day” brings you right back to the beach. And for us Desilets, the odor of gas fumes when that boat engine starts up for the first time takes us to our happy place! My favorite summer smell, though, is the campfire. Those first few wafts of smoke that reach my nose instantly bring back memories of some of the best times of my life – childhood camping trips, my years working at summer camp, and most recently, our family camper adventures. When we light a fire in our backyard fire pit, I always open my bedroom window up above so that I can fall asleep to that smoky smell. After surrendering his heart and his entire life to Christ, the apostle Paul spent the rest of his time on earth traveling and spreading the good news about Jesus. His influence was huge and, thankfully, we have many of his words recorded because of the letters he wrote to the churches he had started (or at least had some role in leading) while he was away from them. In his second letter to the church at Corinth, Paul says this: “But thanks be to God, who in Christ always leads us in triumphal procession, and through us spreads the fragrance of the knowledge of him everywhere.” (2 Corinthians 2:14) The believers in this church were unhappy with Paul after his plans to visit them changed, so in this letter he took some time to defend his ministry and his choices. In this particular verse, he identifies the source of his decision-making – the leadership of Christ. This is, of course, healthy – to a point – as we must learn how to be independent and make the hundreds of choices we will have to make every day as adults. But most of the time this desire to lead the way only leads to trouble. As an analytical thinker and passionate feeler, I always think my way is better – in fact I’m usually 110% sure that my way is better than anyone else’s way! Even those of us who claim we would rather “just be told what to do” don’t actually feel that way when it comes to important decisions in our own lives. This poses a problem when we confess our belief in Christ and then attempt to ‘surrender’ our lives to Him. It’s easy to say “Your will be done,” but it’s much harder to actually live it. It may come natural to look to God for guidance when it comes to major life decisions, but when it comes those hundreds of daily choices, we’d much rather just do what makes sense to us – especially when asking God to lead might mean doing things that are hard, or, as in Paul’s situation, might make the people around us angry. However, it’s in that surrender to His leadership that we, like Paul, are used by God to spread “the fragrance of the knowledge of him everywhere.” I don’t know about you, but when people get a ‘whiff’ of me, I want it to remind them of Christ. When my friends and family are around me, I want them to think of Him. When Jesus said, “Let your light shine before others, so that they may see your good works and give glory to your Father who is in heaven,” (Matthew 5:16) He made it clear that our lifestyle and actions are the greatest way we can share the good news about Him! Most of us want to be the fragrance of Christ to the world around us – we want to give off the scent of Christ in the way we live our lives. Unfortunately, many of us get caught in the trap of thinking that in order to attract people to Jesus, we need to put on a nice, happy face and try really hard to be a good, moral person. But it’s not a trying harder issue, it’s a leadership issue. The essence of evangelism is a life lived under the leadership of Christ. It’s a life where you look to Him and His Word first in every choice – big or small. This will, of course, very likely lead to a more ‘moral’ life and you will have more joy – but that’s not the point. Over the past couple of weeks, after several tragic losses of life in our church, I’ve seen incredible evidence of lives submitted to the leadership of Christ. I’ve seen the diffusion of His scent as broken people have lifted up their hands and declared their trust in God in a way that doesn’t make any worldly sense. When the watching eyes (and sniffing noses) of the world see that, there’s no way they don’t smell Christ. So, as you enjoy the smells of early summer today, remember that you have the opportunity to be a ‘whiff’ of Christ to your world.